This smashing shot from the lens of Mr. French looks so crisp and clear that one could imagine that you were looking at it live! Lough Gill in Sligo is beautiful at any time and this captures the atmosphere and life of the place. Can we locate that place today? The windmill comes from Illinois, USA. Can anyone read the vane? 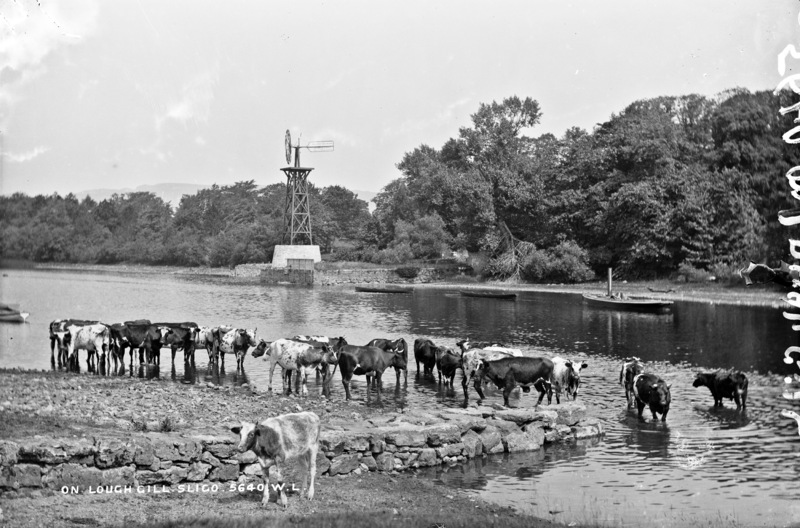 Sligo harnessing wind power, long ago. Great shot. And a little steam power boat, too. It's a "HALLADAY" pump from this company - www.bataviahistoricalsociety.org/exhibits-collections/com... "By 1881, the company was called the largest institution of its kind in the world." On the 25" map, there is an Aermotor pump at Hazelwood House. This Eblana Pair in the archive shows a strange model windmill on this spot in the 1880s, so we are later than that. For confirmation, here is an archive shot of this windmill labelled Hazelwood Co. Sligo. The Aermotor Company is still making machines like this. Mr. C. Cadle, of 39 Wellington-quay, has on Stand 30 a large and varied assortment of goods; and on the ground outside he shows Halladay's standard windmill, adapted for pumping and driving farm machinery. This machine, we believe, is much used in England, where windmills are more numerous than in Ireland. Ah, at least one page says: The windmill was built by the U.S. Wind Engine and Pump Co. of Batavia, IL, the first wind engine manufacturer. The printing on the vane also says it was acquired from the US Supply Company, Omaha, Neb. Someone in Sligo would probably not be buying from the US distributor. Just to confuse, there are a couple more photos with just "HALLADAY" on the vane - catalogue.nli.ie/Record/vtls000322027 (sails folded) catalogue.nli.ie/Record/vtls000323832 (clearest) - which means Mr French was there on several occasions, as seems usual. Ed. found by an NLI search for "Hazlewood"
[https://www.flickr.com/photos/beachcomberaustralia] Hay there, friend, I did not steer you wrong or hide anything. I think my comment was cowherent and hit the Bull’s-eye, it was the gosbull truth. Some would say you were milking it with your comment, I think you were being nobull and it was justifyabull, I have watched your comments for heifer and heifer and I know its pasture bedtime down udder, have a think about what I say over your Moorning Calffee. PS - I wonder did Robert French ask them to say Cheese! [https://www.flickr.com/photos/[email protected]] My misteak - I deserved that roasting! Foxglove A friend who knows cattle thinks a mix of Friesian and Ayrshire?